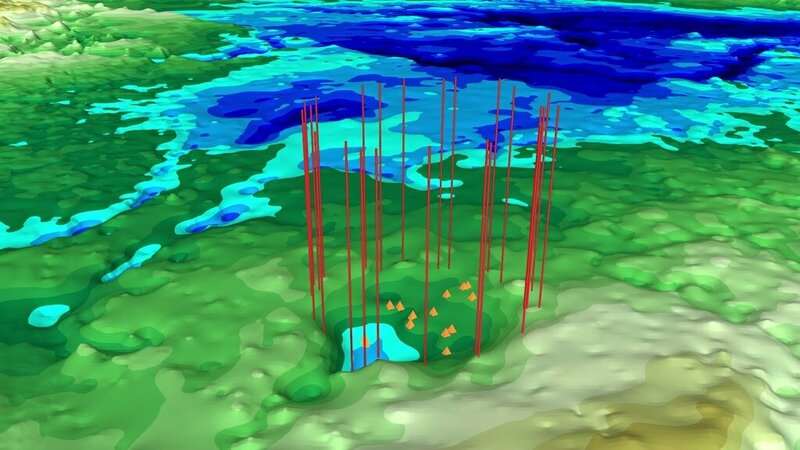 This follows the finding, announced in November 2018, of a 19-mile-wide crater beneath Hiawatha Glacier - the first meteorite impact crater ever discovered under Earth's ice sheets. Though the newly found impact sites in northwest Greenland are only 114 miles apart, at present they do not appear to have formed at the same time. Before the discovery of the Hiawatha impact crater, scientists generally assumed that most evidence of past impacts in Greenland and Antarctica would have been wiped away by unrelenting erosion by the overlying ice. Following the finding of that first crater, MacGregor checked topographic maps of the rock beneath Greenland's ice for signs of other craters. Using imagery of the ice surface from the Moderate Resolution Imaging Spectroradiometer instruments aboard NASA's Terra and Aqua satellites, he soon noticed a circular pattern some 114 miles to the southeast of Hiawatha Glacier. The same circular pattern also showed up in ArcticDEM, a high-resolution digital elevation model of the entire Arctic derived from commercial satellite imagery. MacGregor reported the discovery of this second possible crater in Geophysical Research Letters.